The following feature was first published in Seeds of Gold. Weaving through the sugarcane plantations gives one a feeling of sweetness that Migori County holds. We see plantation after plantation of cane that feeds the South Nyanza Sugar Company, often simply known as Sony Sugar, towering over other crops and pasture. Sugar cane, and tobacco, has been the only cash crop grown in Migori, until recently when proceeds from sugar companies started dwindling. When the vast lands are not under sugarcane, the locals prefer subsistence farming — a bit of maize here and beans there. However, these, too, do not do very well around here. All is not lost, however, as one farmer from the county has found out. Tucked away somewhere in the midst of the towering cane plantations is Mr Nehemiah Odhiambo’s soybean farm. He was among the first farmers to adopt the new crop in the county, and he has no regrets so far. For him, the long wait before harvesting sugarcane was probably the first disheartening factor even before the prices came tumbling down. “I tried growing both sugarcane and tobacco on my farm, but both would take long before harvest and payment. For instance, I have to wait for close to two years for sugarcane to mature, yet I need to send children to school,” he says. He started growing soya beans five years ago after learning about it through a farmers’ cooperative society. Through a farmer friend, Odhiambo got seed and the know-how of growing the crop. To his surprise, his decision would end up bringing him money, exposure and accolades. “I had to learn everything anew. I was very keen to change my reliance on sugarcane,” he says. And reward came fast and furious. The thought of being part of the team that produces the crop that makes Sossi meat, soy milk, soy flour, soy protein and other products never occurred to Odhiambo when he first started growing the crop. 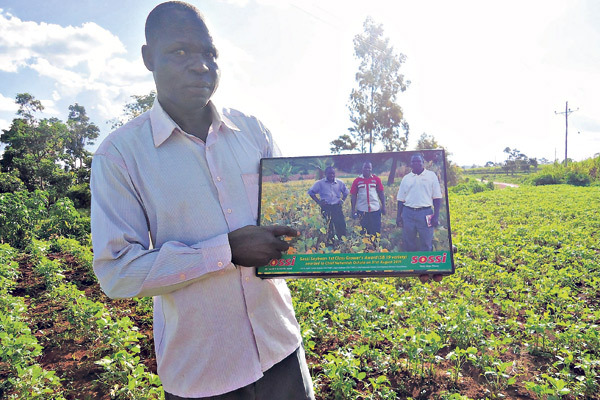 Just a year after adopting soybean farming, Odhiambo was feted as the best soybean farmer in East Africa. Although he does not know how he became the best, Odhiambo is certain about one thing: He did his farming right. “Three companies came to the farm to inspect how the crop was doing and even took pictures of us. Little did I know that they were doing all that for a competition. I was amazed to learn that I had actually won,” he says. The secret, he says was that he plants quality seeds. One acre gives him half a tonne. The father of three explains that growing the relatively new crop is the easiest kind of farming a farmer can choose. However, any neglect can also cost one dearly. The crop is planted two to three weeks before the rains. After preparing the land, he soaks the soy seeds in a Biofix solution, an organic fertiliser meant for of leguminous crops, before planting. He uses his harvest to get seeds for his next season’s planting. “With soya, the current harvest makes the best seed crop and has 99 per cent chances of germinating well,” he explains. Mr Odhiambo says that he got his first seed from a fellow farmer, and since then he has not bought any seeds. However, he prepares seeds for sale to other farmers. Before selling the seeds, he ensures that they are well dried and selected. He sells a kilogramme at about Sh150 to Sh200. Odhiambo gets a harvest of up to 1.6 tonnes from his two-acre farm. Although he has not started adding value to the crop, through a cooperative society (Migori Pamoja Cooperative Society), he and 40 other farmers have managed to get into partnerships with companies like Promasidor, the makers of Sossi. Being a new crop among Kenyan farmers, Kenya produces about 300,000 tonnes of soybeans yearly. Half of the produce comes from Migori County, which produces 156,000 tonnes. However, Odhiambo, who is also the area chief, says there are challenges. He encourages farmers to join cooperative societies to give them a stronger bargaining power.